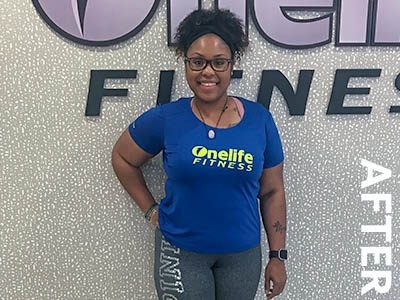 Ashleigh has been on her health and fitness journey for two years and counting. A Mom of five and a total inspiration, Ashleigh is the epitome of a motivation story. After taking a hard look at her place in life, Ashleigh knew she wanted to make a big change and improve herself. Her initial inspiration for beginning her journey was her children, however, she found that she needed something more. She had to do this for HERSELF. Ashleigh works out four to six days a week. Her fitness regimen includes upper and lower body, focusing on conditioning. When she isn't working on her body, she's doing meditation or yoga to make sure her mind is right. For Ashleigh, being mentally strong is just as important as being physically strong. When it comes to her nutrition, Ashleigh began the paleo diet. Since changing what she puts into her body, she has noticed her body fat percentage is dropping, she has more energy than ever before and she even feels less bloated! *Note: Story from the Washingtonian, courtesy of our Onelife Fitness Reston Team. Want to share your fitness journey with us like Ashleigh? Post your story on Instagram and tag us using #IHaveOnelife for a chance to be featured on our digital marketing.